I spent Saturday morning and into the early afternoon with my becoming-a-birder friend, Kerry, with whom I’ve birded before, birding in Queens and a bit into Brooklyn. We didn’t see anything too spectacular until we were about to leave Fort Tilden, though Kerry was very interested in the variety of ducks we found at Jamaica Bay. Anyway, as we were leaving Fort Tilden I spotted Seth Ausabel, who is becoming a fixture on this blog for finding good birds in Queens that I then see, waving us over to him. The reason? A good bird, of course, in the form of a host of Black-legged Kittiwakes Rissa tridactyla feeding off-shore! A new bird for Queens for me! 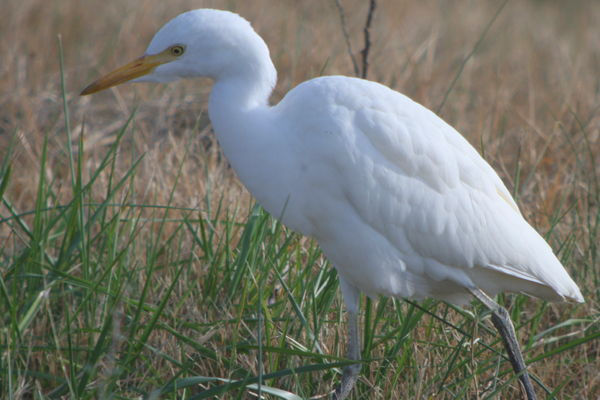 He also let us know that the Cattle Egret Bubulcus ibis that had been reported earlier in the week at Floyd Bennett Field , a mere five-minute drive away, was still being seen. So after thanking him profusely we were off to Floyd Bennett and the Cattle Egret. And the Cattle Egret, my second ever in New York State (the first was in the Bronx), did not disappoint, though it lacked the buff plumes that usually make Cattle Egrets stand out from the other white egrets. It hunted grasshoppers along the edge of the road, grasshoppers it had to find for itself seeing as it lacked cattle to flush the bugs, and it was more than willing to let itself be digiscoped from the car window. We didn’t even have to get out of the car! 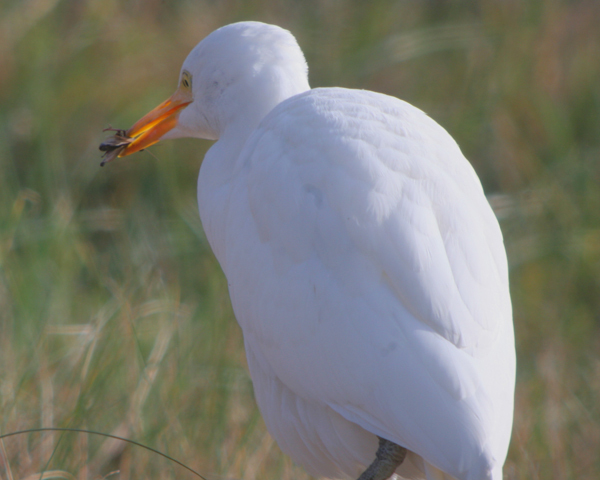 Though Cattle Egret are dirt-common over large swaths of the world they are not an every day, or even an every year, bird in New York State for most birders so it was great to see one, and to see it so well. And though I was mostly impressed with the Cattle Egret, Kerry was awed by another bird that we watched take a grasshopper, a feisty American Kestrel that sallied forth from its perch and returned with and dismembered a big ol’ grasshopper, which we greatly appreciated the opportunity to watch. As for Kerry, well, she owns binoculars and a field guide, calls or texts me somewhat often to ask for identification help on birds she sees in her everyday life, and has now went out on at least two birding-dedicated outings. She’s a birder now, right? 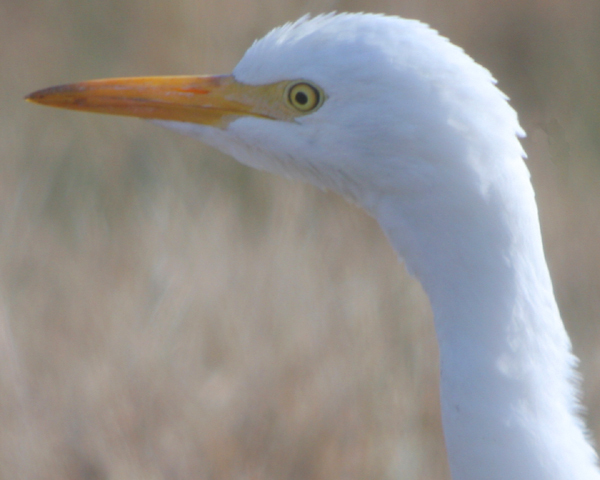 On Dec. 6, 2011, my husband spotted a Cattle Egret on our farm. We live in Dalton, NY (about an hour south of Rochester).